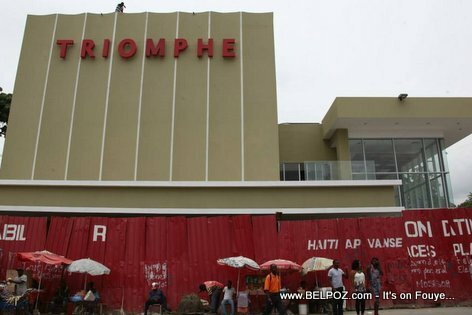 Haiti - Nouvo Cine TRIOMPHE, Tout VIT KRAZE? Mezanmi... Ou kwè sevre Jezi? Yon sitwayen, Francklin Simeon ‏@HedoMag, poste sou Twitter: "Apa-m pase devan Triomphe sou channmas la mwen wè TOUT VIT KRAZE... kidonk pèp la poko janm konnen manifestasyon pa vle di kraze? SMH..."
@stephaneRTPV mande sou twitter: "Eske neg ki di yo se oposition yo kraze cine triomphe vre mezanmi?" @WatsonGermain21 twit: "Neg yo ap manifeste epi yo pwofite kraze vit Triomphe"
@Yvens_R twit: "Kidonk Triomphe la pa ko menm ouvè...yo gentan ap kraze vit yo..."
I think for having an Haiti better, we need to use heavy hands against the fake opposition leaders. We are so late of modernizing our country, the bab people used politics in order to destroy what we have.that means they are thinking about haiti, and just thinking about being in a good position make money.